This Bee Happy Smoothie is not just super delicious, it makes you happy too! 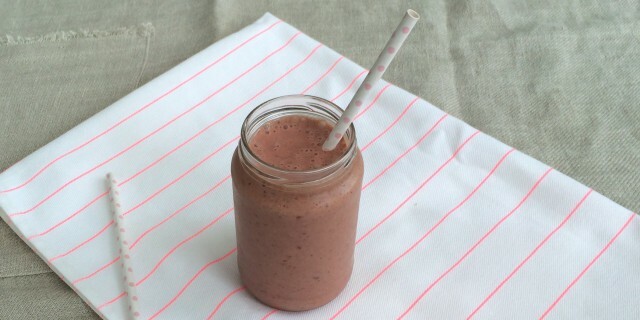 Strawberry, banana and chocolate are a match made in heaven but there’s so much more to this heavenly smoothie! It’s high in fiber and protein and packed with so many nutrients that you can even substitute it as a full meal. Almond milk contains magnesium, selenium, manganese, vitamin E and omega 3 fatty acids which help to fuel our body and boost our immune system. The omega 3 fatty acids in almond milk can also help improve mood. Hemp and flax seeds are another great source of mood-enhancing omega 3 fatty acids. Raw cacao is not only an extraordinary anti-oxidant but it also enhances our mood, as it boosts serotonin, endorphin and anandamide levels in our brain. Serotonin works as an anti-depressant and promotes overall well-being. Endorphins make us feel happy and anandamide take us into a state of bliss and promotes relaxation. I love the slightly sweet, honey-like flavour of raw bee pollen, which works well in this smoothie. Raw bee pollen is also a complete super food and it’s often used as a remedy for hay fever and allergies. It can help to desensitize people to allergy responses by stimulating their immune system. It’s recommended to start on a daily dosage of raw bee pollen a few weeks before the hay fever season. Bee pollen is also rich in easily convertible protein like flax and hemp seeds, which is especially important for post-workout recovery in athletes. Protein is made up of amino acids, the building blocks of our muscles and body. Without it, we cannot build strength and endurance. Add all ingredients to a high-speed blender and pulse until you have a smooth consistency. Serve right away!